As each camper grows, so does our curriculum. 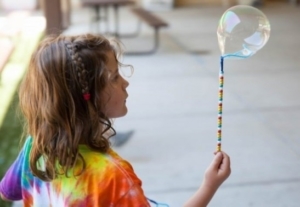 Kids discover more advanced concepts and explore greater creative freedom over time as campers progress from Nebulas to Stars (entering 1st and 2nd grade) and finally, Supernovas (entering 3rd, 4th and 5th grade). But for kids in pre-K or entering kindergarten in the fall, being a Nebula is the perfect fit. With an 8-to-1 ratio of campers to staff, each child will receive the individualized attention they need to thrive. What's it mean to be a Nebula? Nebulas may return home from camp using words such as “visionary” and “trusses” without missing a beat. That’s because Galileo takes a uniquely innovative approach to learning, as we transform children into lifelong learners and innovators who are comfortable exploring, analyzing and learning from experience—including their mistakes. Quite simply, we believe that learning should be fun. At this age, kids are curious and adventurous, while their bodies and minds are quickly growing and evolving. Our programs expand their horizons in clever and creative ways, while promoting stronger motor skills, developing problem-solving capabilities and engaging kids in a social way. Camp Galileo Nebulas focus on developing these key fundamentals in a really fun, dynamic environment. What’s more, our staff members know what skills and abilities campers will need to succeed, as many have a background in education, childhood development or a related field. It’s this unique combination of nurturing, a fabulous curriculum and incredible staff that makes Camp G a standout day camp for four, five, and six-year-olds.